The late novelist Howard Frank Mosher, a resident of Vermont's Northeast Kingdom, set all his books in that hardscrabble region. Disappearances, his first book, was published in 1977. Vermont filmmaker Jay Craven turned the story into a 2006 movie starring Kris Kristofferson. Now, with permission from Mosher's estate, Lost Nation Theater's Kim Allen Bent has written a theatrical adaptation. The premiere, directed by Bent, brings this tale of Prohibition-era whiskey smugglers to the stage. Set in Kingdom County in 1932, Disappearances is the story of Québec Bill Bonhomme's dangerous effort to bootleg Canadian liquor in order to keep his dairy farm afloat. Smuggling is a family tradition, and Québec Bill and his brother-in-law Henry take pride in their stealth and skill and in the sheer speed of Henry's Cadillac, nicknamed White Lightning. But years ago Québec Bill's wife demanded he foreswear the trade — and drinking — and only relents now because their herd is at stake. This time, Québec Bill will bring his 15-year-old son, Wild Bill, to learn how to think on his feet and elude a menacing rival smuggler. Mosher's plot is packed with outlandish, mortally foolish escapades that involve cars, canoes, trains, trucks and an airplane and that take place in snowstorms, rivers or desolate woods. Bent conjures them onstage, but it's tough to build an entire play around actions that must be described or symbolically represented. Still, some events are realized with true grace. Bent stages a wonderfully effective canoe journey. Québec Bill and his son sit in a box that glides on casters as they scoot it with their feet. Their paddling is hypnotic as they loop around the stage, correctly placing a paddle as a rudder for the turns. Sounds of water and a loon evoke a lake, and Québec Bill sings a French Canadian ballad. It's easy to suspend disbelief. Indeed, viewers sufficiently gripped can imagine all the events and settings in the show. But in this reviewer's opinion, the staging and script too often tug the audience out of such a reverie. The canoe making that lazy loop along the stage floor is, inexplicably, a crate without a canoe's tapered ends. The cars, truck and train are cartoonishly distorted boxes. Fastidious realism isn't necessary, but the play cries out for an aesthetic that matches the story's mood. Scenic designer Rachel Langley's version of a comic style is so crude that it undermines the story. Ultimately, the problem isn't the craftsmanship of the scenery but the production's uneasy blend of realism with a supernatural notion of family heritage. 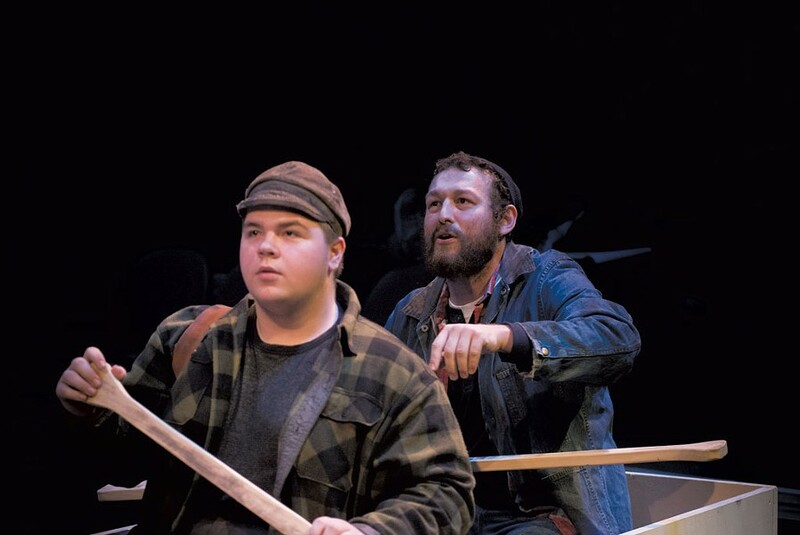 Mosher's characters are outsize but grounded in the hard rural life of the NEK. Bent bookends the play with the supposedly spooky fact that Québec Bill's father, René, disappeared in the woods. This starts the show on a grim note and ends it on an untenably ghostly one, because René's disappearance has no impact on Wild Bill or his dad. The ragged family tree sheds no light on the characters onstage. Mosher's novel makes much of Wild Bill's curiosity about his ancestors, and his coming of age requires coming to grips with their fates. As the book's narrator, the character's interior life is accessible, but onstage Wild Bill can't convey such thoughts. Even when it comes to action, the adaptation struggles. Viewers are likely to have a hard time figuring out where all the cases of liquor are, since some are indicated in pantomime and others made tangible; worse, some booze is lost to unseen or unstageable disasters. A character pushed into a river is nudged offstage as someone else describes the splash. All told, the story never gathers the steam of easy-to-follow adventure. And the play doesn't elevate the characters to Mosher's mythic proportions. The language is lean by way of mundane, and the dramatized actions rendered without spectacle or surprise. And so Québec Bill can bound with a spring in his step, but the character isn't much more complex than the actor's wonderfully wide grin. Wild Bill, played by Timothy Worn, never bursts with awe at his father's daredevilry. Bent's story structure moves back and forth in time, with Wild Bill summarizing events that are not dramatized. Worn delivers that exposition blank-faced, seemingly unaffected by events, including his unlikely survival. Leon Axt, as Québec Bill, has a keen way of looking and listening that does much to conjure up the natural world. He thrills to a hawk's flight and eagerly nudges his son to notice the joys and perils of the woods. Axt makes Québec Bill so charming that his boasts of brutality are unconvincing, but his love of family is vivid. Mark Roberts plays a variety of characters, but his principal role is Henry, the rumrunner who gets cold feet as the danger thickens. Roberts is exquisitely torn between retreat and trying to save Québec Bill from trouble. By showing Henry's affection for Québec Bill, Roberts becomes the play's emotional anchor. Aaron Aubrey takes on several roles and finds a comic edge for each. As the farmhand Rat, he's the adventurer who conks out from drink or exhaustion, then startles awake in a high-stepping jangle. Lara Foy is plaintive yet decisive as Québec Bill's wife, Evangeline, and the affection between the couple is richly presented by both actors. Christine Williamson plays Aunt Cordelia with faintly mystic gravity. Paul Molnar portrays a monk and a train engineer, among others, with a nice sparkle. Bent collects all of Mosher's competing themes — realistic characters with a mythic aura, a family's ominous heritage, comedic exploits and breathless adventure. What he doesn't do is enrich them by putting them onstage. It's an accomplishment to convey the novel, but the ghosts that drive the book don't haunt the stage, and the rollicking antics are more often told than shown. The original print version of this article was headlined "Of Myth and Men"